2) Finish piecing the back, baste, quilt, bind, label, Baby Quilt Commission #2. Now on to the Q2 list! I've lost soooo much steam on this... I've second guessed so much about it that it's become quite a struggle. 2. Quilt, bind, and label Geometric Gift Quilt. I made no progress on this since last Summer. Must get it done! This will be a good one to work on in the in-between moments. 3. Make backing, baste, bind, and label Alabama Quilt Top. While we were in Alabama last September, I picked up a vintage unfinished quilt top for $5 in some lonesome thrift shop. I've never finished a vintage top, so I'm excited! 4. Quilt, bind, and label Maybe Lyz Quilt. A friend might like this one, so I'll try to finish it up for her and see what she thinks. 5. Piece front and back, baste, quilt, bind and label Atlanta Falcons Quilt. I'm tentatively naming this quilt after the teams colors (no, I don't watch football). This is a wild card... I have the fabric pull, have the idea, but I'm not sure if I'll actually get to it let alone this quarter. And even if I do, I'm not sure it'll go to who inspired it. It's hard to look at another list that is almost all older projects needing to get finished! I'm tempted to add a bunch more starter projects. But I know I want to clean, clear and finish before I start new so I'm sticking with this list. I only hope my Q2 be as productive as Q1. I'm linking up with the 2016 Finish Along and with Slow Sunday Stitching. When one of my best friends let me know she was pregnant, she also let me know that I would be making her a baby quilt. Luckily, I already knew just what to make her! Orange Cat/Grey Cat is an ode to two wonderful cats that the family have had. Grey Cat sadly passed away, but Orange Cat is the resident babywatcher and watchercat. The top for OC/GC was made using mostly new but some vintage fabrics. Most of the cats are black or white, but please note the orange and grey cat hiding there. I know my friend likes bright colors, but couldn't resist the making the top stark black and white with hints of pattern and color. From the very start of this quilt I knew I wanted the back to be as bright a rainbow fabric as I could find. I really liked this wavy new fabric. Bc it was soo busy, I decided that it was enough on it's own and didn't need to be a pieced backing like many of my quilts. I used a new cotton batting for this quilt. I had a really hard time deciding how to quilt OC/GC. I didn't want the quilting to stand out too much or take away from either side of the quilt. So I tried something new and used a clear poly thread. It was certainly a challenge to work with, but I love the results! I quilted it in a straight line grid pattern avoiding the cat faces when I could. I folded over the backing to make the binding (as is my usual style). I really like the way it added to the colors of the front of the quilt and focused the black and white. This quilt finished at approximately 46" x 39 1/2". I made a simple label with no stamp, just stating the name of the quilt, my name, and added "For Calvin". I took this quilt out for a walk around my new neighborhood to get some good shots. 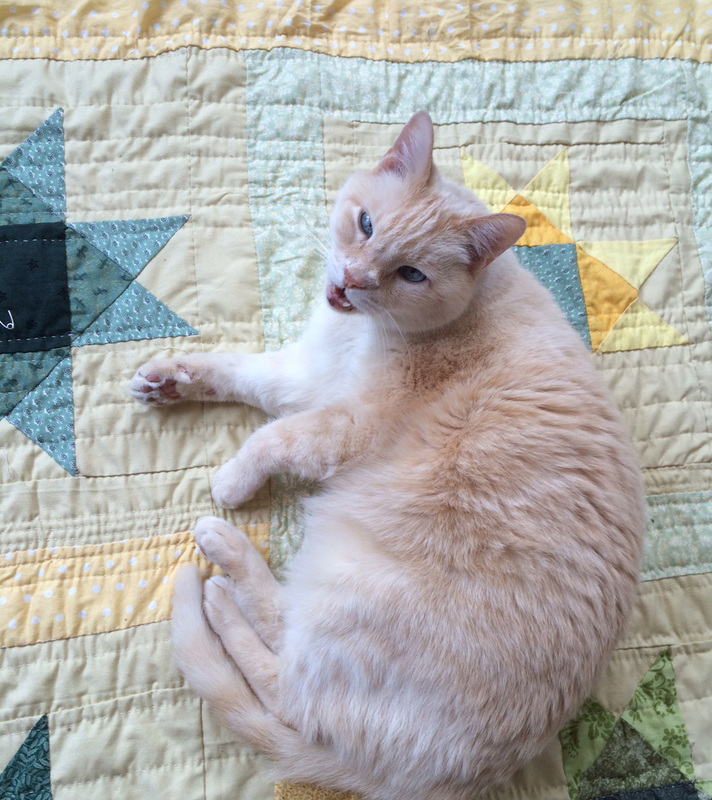 All my cat helpers worked on this quilt. But Pit was the most helpful as I basted and bound Orange Cat/Grey Cat. This quilt is on my Q1 list for the 2016 Finish Along and I'm linking up with Kathy's Slow Sunday Stitching.